Philippine Resort 'Crimson Resort and Spa Mactan' is offering a "Stay 3 Pay 2 Package". Valid until March 31, 2011 guests can take advantage of of a special promotion that allows 3 people stay for the price of 2. Room inclusions for are a welcome drink, buffet breakfast for two at Saffron Cafe, 60-minute billiard game in Score Sports Bar, roundtrip airport transfers, Free WiFi in all public areas and guest rooms, complimentary scheduled transfers to Ayala Center and SM City Cebu, complimentary local calls, 10% off on all food items in all F&B outlets and 10% off on aqua sports activities. From savoring the delectable menus skillfully prepared by the chefs or taking on the wide range of water sports and recreational activities for your enjoyment,whatever your pleasure, Crimson Resort and Spa Mactan is the ultimate seaside playground for all ages. 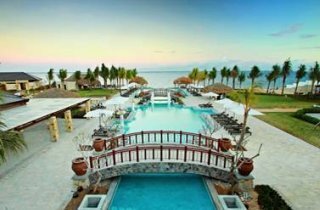 Synonymous with luxury and personalized service, Philippine Resort 'Crimson Resort and Spa Mactan' is the new resort everyone has been waiting to enjoy. The sprawling six-hectare Crimson Resort and Spa features world-class amenities and facilities carefully detailed to achieve the ideal marriage of both comfort and style. There are 250 guest rooms and 40 villas with 38 plunge pools and 2 casitas. Crimson also boasts of four impressive and uniquely designed restaurants and leisure facilities, including the distinctive Grand Coral Ballroom and Aum Spa. When you've been treated like royalty, the experience will linger long after your stay!